ISTE Coaching Standard 1 provides four benchmarks for technology coaches to inspire and participate in the development and implementation of a shared vision for the comprehensive integration of technology to promote excellence and support transformational change throughout the instructional environment. My focus is on benchmark d: Implement strategies for initiating and sustaining technology innovations and manage and change process in schools and classrooms. ISTE Coaching Standard 2 provides eight benchmarks for technology coaches to assist teachers in using technology effectively for assessing student learning, differentiating instruction, and providing rigorous, relevant and engaging learning experiences for all students. My focus is on benchmark f: Coach teachers in and model incorporation of research-based best practices in instructional design when planning technology-enhanced learning experiences. How can I help a teacher to reinvent a learning activity so that it is more engaging, authentic, and meeting 21st century learning standards? Now that my peer coaching partner and I have rolled up our sleeves and analyzed a lesson using the Learning Activities Checklist, it’s time to brainstorm ways that we can improve the learning activity so that it is more engaging, authentic, and meeting 21st century learning standards. Although there are many established organizations that provide teachers with a launchpad for engaging and authentic project-based learning, it is important for teachers to learn how to independently develop projects with their students. A peer coach can facilitate the lesson-design process. Les Foltos notes, “many educators need both a research-based process for lesson design and resources related to that process as scaffolding to help them create similar learning activities” (2013). 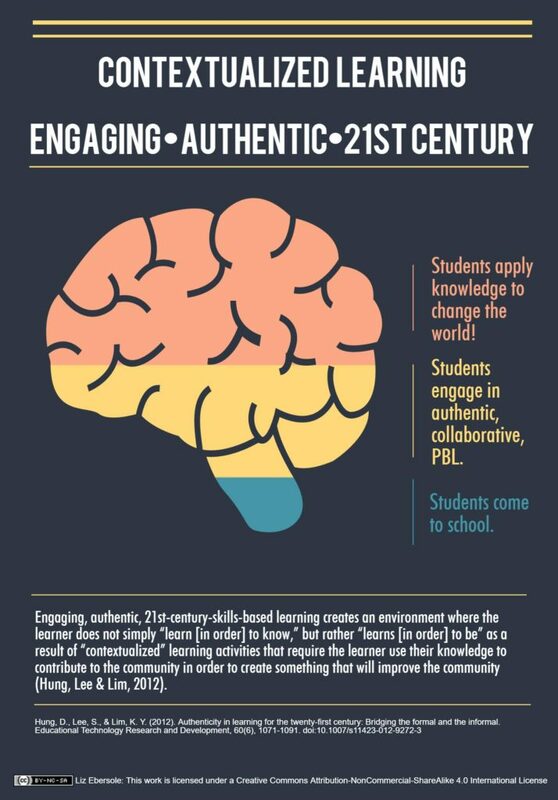 As I combed through the available peer-reviewed research that fit my question, I began to focus more and more on the phrase “21st century learning,” because no matter how “overplayed” it may be, it still encompasses the type of learning experience at the heart of my question: engaging and authentic. Here is my reading list on Diigo. One of my favorite takeaways from my reading was that engaging, authentic, 21st-century-skills-based learning creates an environment where the learner does not simply “learn [in order] to know,” but rather “learns [in order] to be” as a result of “contextualized” learning activities that require the learner use their knowledge to contribute to the community in order to create something that will improve the community (Hung, Lee & Lim, 2012). I learn best by example. As students taking this Educational Technology Leadership course in the SPU DEL Master’s Program, my cohort-mates and I are exposed to many good examples of collaborative, project-based learning, and the lesson-design process during our classes with Les Foltos. I’d like to recreate that kind of learning with my peer coaching partner. P21’s 4Cs Research Series: four documents, each one focuses on the latest research in one of the 4Cs. P21 4Cs Professional Development Series: a badge learning program that was developed in partnership with Participate Learning ($75/course). This may be the ideal way for a teacher who is new to all of this to learn about it… rather than doing a lot of extra-curricular research and reading… and they’ll receive a nifty badge for each completed course. Foltos, L. (2013). Peer coaching: Unlocking the power of collaboration. Thousand Oaks, CA: Corwin. 21st Century Learning, 21st Century Standards, 4Cs, Diigo, P21, Participate Learning, PBL, professional development, project management. Bookmark. How can school administration support professional learning? I really like the organization of your post. It is clear and very easy to follow. You can tell you have addressed several key pieces to your exploration in a very organized way. I echo your sentiments in that I feel really fortunate that we were able to explore these 21st century learning activities in a hands on collaborative way as a cohort. I definitely strive to recreate that as well. The P21 resources are so valuable. I found them very helpful a few weeks ago, and I am glad you found the same! Great resource to build your Peer Coaching toolbox! I also appreciate rich examples both as an educator and a student. Thanks Liz! I love the resource you created and your take on 21st century learning as focusing on “learning to be” rather than “learning to know”. Thanks for sharing! Great toolkit and a powerful metaphor, teachers as project managers of student learning. I am keen to hear how these resources and this model of learning shape collaboration with your peers. I’m with you… the phrase “21st Century Skills” is in danger of being overplayed and overused, but at the same time, it’s severely underrepresented in the practical application of day-to-day learning in many classrooms. And many teachers’ understanding of P21 seems to focus on the technology “stuff” rather than the other softer skills (collaboration, creativity, abstract problem-solving, group projects) that employers are craving. I hope that colleagues don’t tire of the label before we have a chance to fully implement the skills into our teaching.